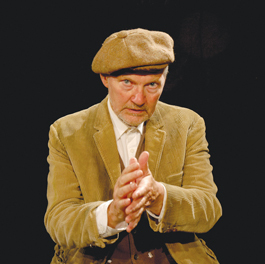 STANFORD SUMMER Theater's production of Faith Healer, a play by Brian Friel (Dancing at Lughnasa), features Andy Robinson as the intriguing titular character, Francis Hardy. Frank begins his chat with the audience by listing the names of "dying Welsh villages" that his traveling healing show has passed through. He often repeats this list for the "sedation of the incantation." Dipping into the low register with an occasional rumble, Robinson's commanding voice makes it easy to see the wild je ne sais quoi that sparked Dirty Harry director Don Siegel to cast Robinson as the "Scorpio killer" in 1971. Not so much charismatic as intense and smoldering, Frank introduces himself as a man tormented with questions about his accidental power to heal ("Is the power diminished? ... You're becoming a husk aren't you?"). With a long, driving, nicely modulated monologue, Robinson rolls out the first in a series of monologues by himself, his wife, Grace (Courtney Walsh Phleger), and his promoter, Teddy (Jeffrey Bihr). Together, they spin a thick, language-born fog both moody and murky, since the tales have a tragic cast and our narrators are unreliable—a source of muted humor. Was that fateful village in north Scotland as sunny as Teddy remembers or as dreary and sunless as Grace remembers? Frank speaks of Grace as supportive and devoted; Grace reports that they fought and twisted the knife. Leaning toward minimal production elements, director Rush Rehm drives movement and meaning by way of white lighting—spots that isolate, house lights that draw in, a gradual creeping darkness for finality. He also maintains a somewhat static sense of place; onstage, ghostly rows of empty wooden folding chairs face backward toward a blood-red curtain—danger, theater, healing, universe and spectacle merge here. While someone delivers a monologue, the other two characters sit in the chairs, facing away, occasionally murmuring, their movement slight and slow, as if they inhabit a connected but alternate universe. The trick to enjoying (and following) this play is to let go and fall into the word pictures: "The sun was orange. ... " Loving the music of Irish cadences served up in thick brogues will also help. The actors make it easy with riveting performances. Pulling from deep emotional waters, Phleger's Grace begins by untelling much of what Francis has just told. Distracted, depressed, sometimes nervous, she pads about in her socks and slippers, unkempt, hunched over a cigarette, pulling her elbow-padded cardigan tight around her. Subtle nuances by all three actors make Bihr's easygoing, natural Teddy feel more in-the-present than the other two. Teddy addresses the audience as if it exists, and house lights come up to reinforce that sense. Teddy's streetwise Cockney accent, his directness, pragmatic approach and lack of irony, help us identify and look to him to bring clarity out of the fog. Teddy is also physically more vivid with rosy cheeks, bronze smoking jacket and matching bow tie (Connie Strayer, costume designer). Rehm's choices lean toward a gravitas that leaves little room for the quirky textures suggested, perhaps, in Frank's description of his life "balanced somewhere between the absurd and momentous." Instead this show maintains a dark poetry and reveals brooding characters, shadowy as subatomic particles, coalescing around the hypothetical event of an erratic healing gift.